NGC 6744 (Caldwell 101) is a magnificent barred spiral galaxy in the southern constellation of Pavo (The Peacock) about 30 million light years distant. 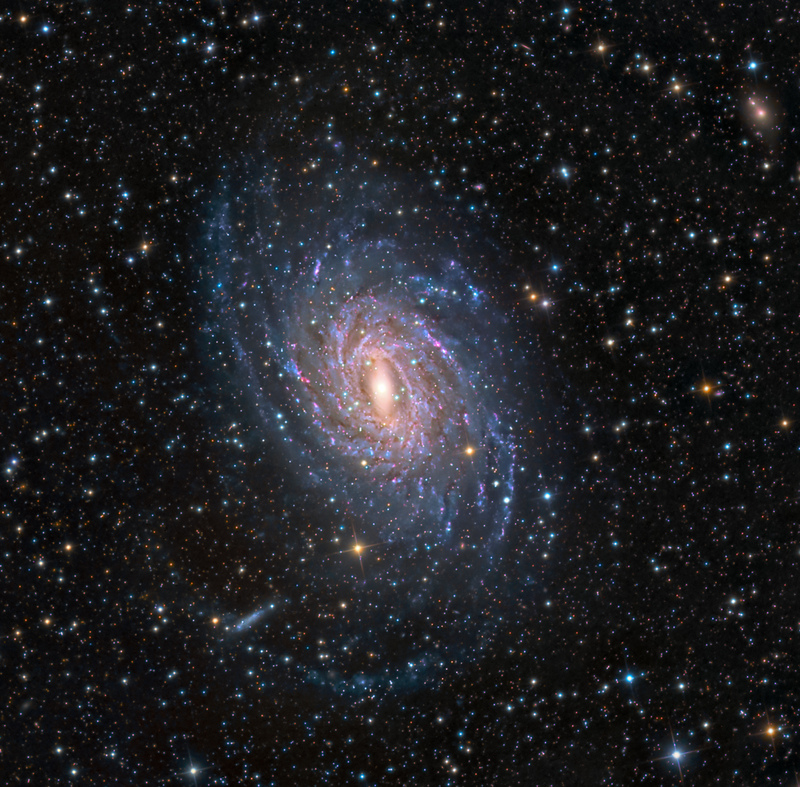 The image above encompasses about 1/2 deg, north is toward the lower right and the galaxy is about 22′ x 15′. It is tilted about 50 degrees to our line of sight. NGC 6744 is thought to be very similar to the structure of our own Milky Way, except that it is nearly twice as long. It seems to have captured a smaller galaxy, seen at the end of the lower spiral arm near the bottom of the image, much like the Large Magellanic Cloud is to our galaxy. This small galaxy is referred to as NGC 6744A. The fuzzy bright yellow object near the upper right of the image is IC 4823, a spiral galaxy 515 million light years distant. There are many pink areas of new star formation in NGC 6744.